Not too long ago, I had the chance to visit the beautiful city of Odessa. When I casually mentioned how weird it was that the train station in Odessa – as well as train stations in Bender and Tiraspol (part of Transnistria, the country that doesn’t exist) has a lot of armed Interior Ministry cops posted there, I started getting comments about how a) it’s a good thing that armed police are on guard in public areas, and b) that the police in Odessa are a force for “good” against the “evil” influence of the Russian president, Vladimir Putin. First, let’s be clear about train stations. In this part of the world, train stations are popular places, not just for people who are traveling, but also for people hawking and vending things. Tens of thousands of people pass through the train station in Odessa every day. So yes, of course it’s slightly “normal” that a police officer or two might be necessary for the occasional altercation or disruption. But these are public spaces, and it’s not like the police are checking anything, or operating metal detectors, or inspecting luggage. They’re just standing around, looking menacing, without actually doing anything. I mentioned their presence as an aside, simply because I did notice it, and also because I’ve seen a similar pattern here in Moldova. Whether or not Ukraine is on a war footing, or Transnistria (where the war ended before my wife was even born) is a tense place, or Moldova (which is about as peaceful a country as you can find on this planet) has a few ongoing protests, seems irrelevant. The governments in this part of the world are severely over-stretched with tiny budgets, yet seemingly always have money to post armed agents all over the place. That was what I found curious. I was then “reminded” that a horrible massacre occurred in Odessa. Yes, I was aware of it, and indeed it was foremost in my mind as I wandered through the beautiful city on my journey. 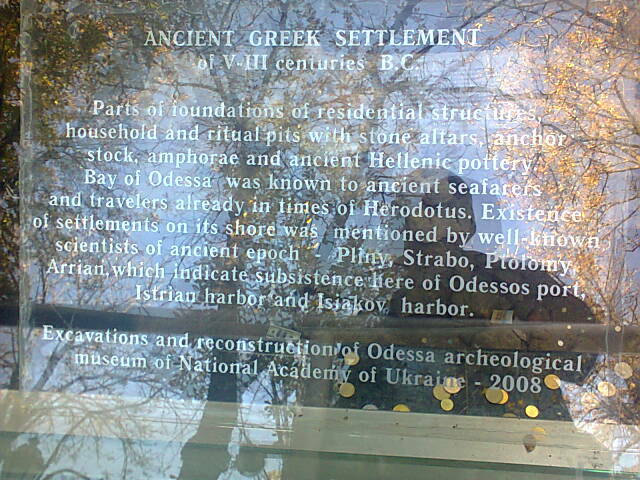 Odessa is a gorgeous place with a rich and interesting history, so how could such an evil atrocity have occurred there? And what role, exactly, did the “good” Ukrainian police play in all of that? Before we can get the answer to that, it’s time to take a quick look at the history of Odessa. An untold number of Moldovans (including my friend the conductor, who travels to Odessa daily) told me a few “facts” about Odessa that were only partially true. The first is that Odessa was once a Moldovan city, and the second was that the city was founded by the Russian Empire under Catherine the Great. Over the years I’ve also heard from Romanians that Odessa was once a Romanian city. So what’s the real story? The Greek settlement eventually gave way to the expansion of the Turkish Ottoman Empire, which build a fort named Khadjibey in the area. And then, yes, after losing the Crimean War, the Russian Empress Catherine the Great started building what soon became the city of Odessa. Unfortunately, she named it Odessa out of the mistaken belief that this was the name of the former Greek settlement, but now, of course, it’s too late to change the name. But boundaries in those days were a bit more fluid than they are today (especially because passports and visa restrictions didn’t exist). Odessa, due to the fact that it was a major port on the Black Sea, was one of the most cosmopolitan cities in all of Europe. About a third of the people were Jews, and there was a significant portion of Romanians/Moldovans as well. Indeed, the modern suburb of Odessa named Moldovanka got its name due to the large number of Moldovans who had settled there. After the Russian Revolution of 1917, the situation became very unstable, and after a ton of fighting and slaughter, Odessa, along with the rest of Ukraine, was incorporated into the Soviet Union. But Romanians (and Moldovans, which were then part of the Kingdom of Romania) never forgot their “lost cousins” in the city of Odessa, and so made the fateful choice of signing the Molotov-Ribbentrop Pact on August 23, 1939. What happened next was a nightmare, as I’ve written about at length. In 1941, Romanian troops murdered tens of thousands of innocent people in Odessa, and burned down large parts of the city. The end goal of the Romanian fascist forces was to expand Bessarabia (what is now the country of Moldova) all the way to Odessa, and then work with Germany to increase the Ostsiedlung all the way to the Bug River. On August 23, 1939 the Romanians were riding high with their German allies, greedy with the thought of territorial expansion. On August 23, 1945 the Soviets declared victory over the Germans, and the day became an important holiday during the Communist era of Romania. And Bessarabia was “reclaimed” by the Soviet Union, forever splitting Moldova into two parts. After the end of the Soviet Union, the eastern part became the Republic of Moldova, where I now live today. So, long story short, the histories of Odessa and Bessarabia are intertwined, having changed hands multiple times between Turkish and Russian forces. And, it should be remembered, that Russia and Romania/Moldova were friendly allies up until the 1917 Revolution. Indeed, it was Russian forces that saved Romania from being wiped off the map in 1916. World War 2, the greatest savagery the planet has ever witnessed, ended with a lot of tragedy in Odessa. After the Odessa Massacre (largely erased from Romanian history), and severe fighting (leading Odessa to become one of the 12 Hero Cities of the Soviet Union), most of the Jews were dead and most of the ethnic Romanian/Moldovans were gone as well. Today, little remains in Odessa of this past except for two synagogues and a couple of place names. There are virtually zero Romanians/Moldovans living in the area, and you cannot even change Romanian or Moldovan money there. Because of the beaches, it’s a popular tourist spot in the summer, but during the colder months it’s mostly a working town. 2014 was a difficult year for Ukraine. First, the country was completely ignored by Romania until the Ukrainian president was illegally deposed. Then, after Crimea was re-absorbed into Russia, millions of Westerners (including George Soros) lost their mind and started to believe that Vladimir Putin was on a crusade to re-establish the Soviet Union. I knew that wasn’t going to happen, and wrote about it a year and a half ago, and have since been proven totally correct. Inside Ukraine in mid-2014, the situation was very fluid. It wasn’t at all clear who, exactly, was in favor of being ruled by Kiev or who wanted closer ties to Russia. After all, many citizens of Ukraine speak both Ukrainian and Russian, and sometimes Surzhyk, a mixture of the two. Donbass effectively seceded, and there are still tensions today in areas like Mariupol. But what about Odessa? It’s hard to know just what percentage of native Odessa residents are “Russian”. Some reports say about a third, while others put it higher or lower. I can tell you that in 2015 that about 90% of the signs were in Russian, including street signs and other government stuff. Russian is certainly widely understood there (and Romanian is definitely not) and I didn’t see a single anti-Russian poster, graffiti or sign during my trip, unlike in Cernauti. I did, however, see the local political party headquarters of the Ukrop Party, which made me smile as I wrote about that six months ago. Today, Odessa is very peaceful. Aside from the anomaly of a lot of armed Interior Minister troops milling around the train station, the city is calm, relaxed, and beautiful. In my explorations in town, I failed to see a single other cop except at the train station. So clearly the city is relatively at ease these days. But in May 2014, the situation was a lot different. Both pro-Kiev and pro-Russian demonstrations were being held on a regular basis, and nobody knew quite what was going to happen. On May 2, 46 people were burned and/or stomped to death by a mob, most of them pro-Russian activists who had been holed up in a building in downtown Odessa. Personally, I avoided even walking by that building because I didn’t want to think about the evil event that had taken place there. There’s plenty of propaganda and bombast from both sides about what exactly happened, but the issue I am most interested in today is what role the police played. First, the chief of police was fired immediately following the incident. The Interior Minister, Arsen Avakov, said “The police [in Odessa] acted outrageously, possibly even criminally” during the incident. Secondly, the fire department did not respond until hours after the building was set on fire. True, firefighters aren’t police, but it’s clear that much of the local government was intent on (at least passively) letting these people die. If that’s not enough evidence for you, click on this link. I’ll warn you that it contains graphic photos and videos of dead people, as well as footage of a pregnant woman being killed, so it’s definitely not safe for work. And while some people believe that the heroic police “did their best” to control the crowd, there is substantial evidence that (at least a faction of) the police were more than eager to see people die that day. Of course, as with any fighting, there are atrocities committed by all sides. If your tribal spirit is now frothing over, believing I am a dirty Putin and Russia lover, take a drink of water and relax. The deaths in Ukraine are all needless and senseless violence, and I abhor all of it. I am only writing this piece to explain just what the “good” police officers of Ukraine were up to in 2014, and why I am not exactly happy to see them uselessly standing around the train station. And, although I was grateful that I didn’t see a sign of him during my trip to Odessa, it must be remembered that the “governor” of the “county” of Odessa (the larger region that includes Odessa the city) is none other than Mikhail Saakashvili. I’ve been following the man since his main opponent mysteriously died in 2004 due to a “heater malfunction”. Right now, he’s a wanted criminal in his home country of (the Republic of) Georgia, but he’s in Ukraine today entirely because he is one of the State Department‘s stooges. Way back in 2008, Saakashvili was America’s shining hero, his country’s troops on their way to becoming official members of NATO right at Russia’s doorstep. Unfortunately, Saakashvili was told to go ahead on an attack (similar to April Glaspie in 1991) on the breakaway region of South Ossetia. Russia responded with force, rolling tanks right into Tbilisi, and Saakashvili was caught on camera nervously eating his tie in fright of being bombed by Russian planes. That was 2008. But by 2012, the people of Georgia were sick of his cronies and outrageous corruption. Saakashvili is now unable to return to Georgia because he would soon be arrested on multiple charges. In early 2014, he repeatedly appeared in Kiev to support the protesters and the new government after the president was overthrown. He then moved to the United States for a bit of training and then returned to Ukraine. In gratitude for his “help”, the current president of Ukraine (Poroshenko) gave Saakashvili Ukrainian citizenship and made him the “governor” of Odessa Oblast. I have no idea how “popular” the man is in Odessa because he’s never run for election, but he is definitely beholden to Poroshenko, for what that’s worth. Today though, Ukraine is still doing remarkably well, despite all the geostrategic wrangling, corruption, debt, and fighting in the east. It’s definitely a far wealthier country than Moldova, with much better infrastructure. And, as Crimea is now out of bounds, Odessa is most definitely the pride and joy of the Ukrainian Navy, with tons of nautical-themed souvenirs for sale and actual sailors to be seen everywhere. Definitely a lovely place to visit, and a city I’d highly recommend to everyone. 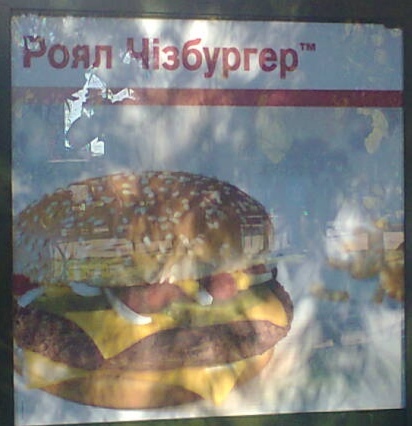 And if you get hungry, you can actually order a Royale with Cheese. You did not answer Rodeo’s point by point arguments. Are you honestly saying Romania was signatory to the Molotov-Ribbentrop pact? I guess the next thing we’ll be finding out here is how Poland started WW2. Technically yes, the deal was between Germany and the Soviet Union but if you read my piece Fury Unleashed you can see more info about Romania’s participation in that pact and the negotiations that went into it. Sorry, can’t see the connection. Even if what you wrote in “Fury Unleashed” with regard to the Iasi massacre (and not only) is completely fair comment, how does this have anything to do with Romania being signatory to the Hitler-Stalin pact? I have always wonder why you were sent out from Romania. Now I get the answer. Usually you ceck your facts better but this time you have so many basic mistakes in your post that I wrote this just to tell that for the first time in 4 years of folowing your blog you dissapoint me. And I’m not speaking about your opinion on things, just about the facts. This thing is wrong both literally and as to the respect of the intentions of Romanian authorities in 1939. Other commenters already addressed this. Again, do you know who were the allies of Romania in 1939? Some who excused themselves that they are too far away to help and some too close not to get greedy, but not Germany. And yet the king Carol had a secret military agreement signed with Germany and the Austro-Hungarian Empire exactly against those friendly allies. On the diplomatic level things were civil, the Czar and his family being welcomed in Constanta during a sea voyage but nobody forgot the Russian Empire’s goals on the Black Sea shores and in the Balkans. Well, amongst the wide-spread non-combat, leaving of the agreed front lines, rebellion and an attempted coup, those few troops that were involved in low-intensity defensive battles can hardly pretend that they saved the day. Not to mention the cold-blooded wretchedness of of both pre- and post- revolutionary Russia governments who seized all the weapons and food Romania payed in the West and Russia agreed to transport from Arkhangelsk to Iasi. As to imply that Romania ever was officially interested in expanding its territory over Odessa is just childish. Only children can make the mistake to listen to the blabber of a few extremist minds and think that represents a whole nation’s will. What does it means? Putin is not evil in your sick mind? He’s a man. Sometimes he does good things, sometimes evil things. I agree. Putin is just a man who is at times evil and at times looks out for the best interests of his country (not necessarily his countrymen) and of his own as we all do. A return to the Soviet Union wouldn’t be such a bad thing as there were certainly less random acts of terror when the USSR existed, or maybe we didn’t hear about them as the internet and 24 hour news channels were in their infancy at that time. It just seems that the image of the two superpowers with their fingers poised over THE button, ironically, led to more overall peace – at least in North America and Europe. I could be wrong and probably am, but that is my opinion.